Groove recently partnered with Tokidoki x Hello Kitty to release a collaboration Pullip. 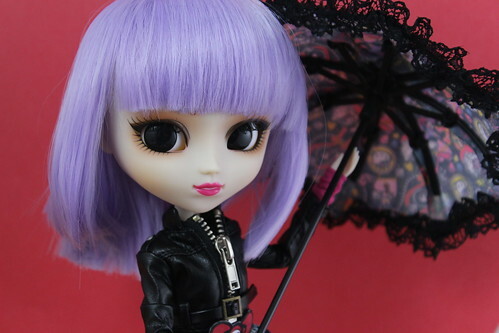 Two versions of Violetta were released, a standard version which is widely available from Pullip sellers such as Pullipstyle as well as a Special version that is available exclusively through Groove’s official shop and JPGroove. The standard and the special version of Violetta are identical except for the fact that the special version comes with three additional accessories. The standard version of Violetta has a MSRP of 16000 yen, the special version has a MSRP of 20000 yen so there is a price difference of about $40. I ended up getting the special version, I have already done a review of Violetta which can be seen here which highlighted her as a standard release doll this post will instead focus on highlighting the accessories that are exclusive to the special version. So what are the three accessories? 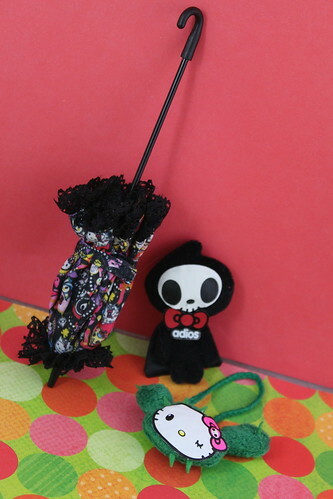 A parasol, a purse and a Adios plush all Tokidoki x Hello Kitty themed. 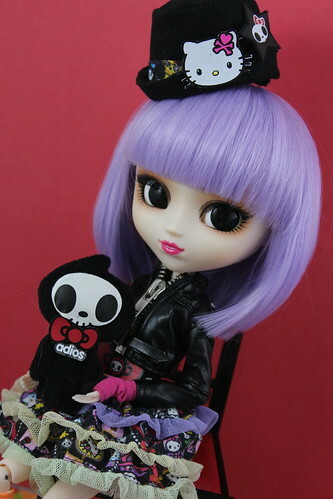 I’ve seen the criticism that the normal version of Violetta should just come with the Special extras standard as the previous Tokidoki Pullips each came with a Tokidoki purse and plush BUT more realistically unlike the other Tokidoki Pullips Violetta is also a collaboration with a third company Sanrio (the owners of Hello Kitty). The only way it was probably financially feasible for Groove to include accessories without cutting into the profit margin which is already getting split three ways was to release a special version at a higher cost, so at least the general release is priced similarly to other collaborations. This way if people just want the doll without the accessories there is an available option rather than having to shell out extra money for accessories they may not want. So are the accessories worth the extra cost? Let’s take a look! 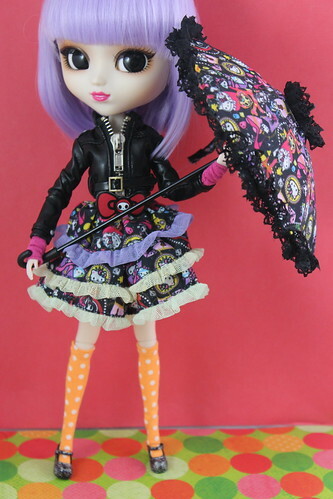 My favorite of the accessories is the parasol, it’s an unexpected addition to Violetta’s stock but it works. It is absurdly adorable. 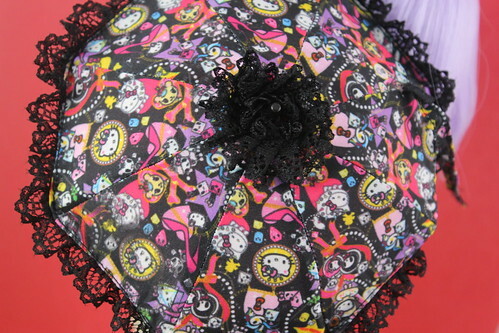 Even the inside of the parasol is cute. Close up of the parasol, the print is the same as on Violetta’s dress and I think that is pairs nicely with the black lace. The Cactus Friends Sandy-style Hello Kitty has been a very popular style when Tokidoki and Hello Kitty had previously collaborated it has been featured on purses/other clothing items as well as plush toys. I love the little details like if you look at Hello Kitty’s trademark bow it can be noticed that it actually features Tokidoki ’til death do us part character Adios’ face. A cute plushie rounds out the exclusive accessories. The Adios plush comes with Hello Kitty’s trademark bow. Verdict: I would definitely recommend the Special version over the normal version to fans of Tokidoki and Hello Kitty as well as Pullip. The accessories are well-made and very cute, I am especially fond of the parasol….I’m not going to lie would have probably pushed me into getting the Special version versus just the regular version by itself. The special version of Tokidoki x Hello Kitty collaboration Pullip Violetta is available exclusively through JPGroove here in the US. 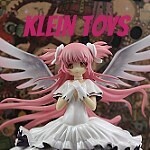 The standard version is also available at JPGroove as well as Pullipstyle. More pictures of Violetta are available on my flickr. 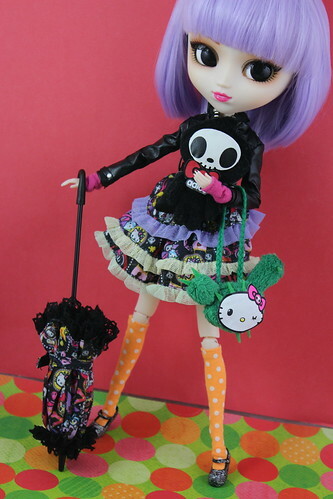 This entry was posted in Doll, Pullip and tagged cactus friends, hello kitty, Pullip, sanrio, tokidoki, tokidoki x hello kitty, violetta. Bookmark the permalink.